Possession acts as an earthly host for promoting tales of sinister triumph. After fledgling years spent in perpetual strife, they have crafted their art from burnt witches, demonic visitations and the last Chief Exorcist of Rome. 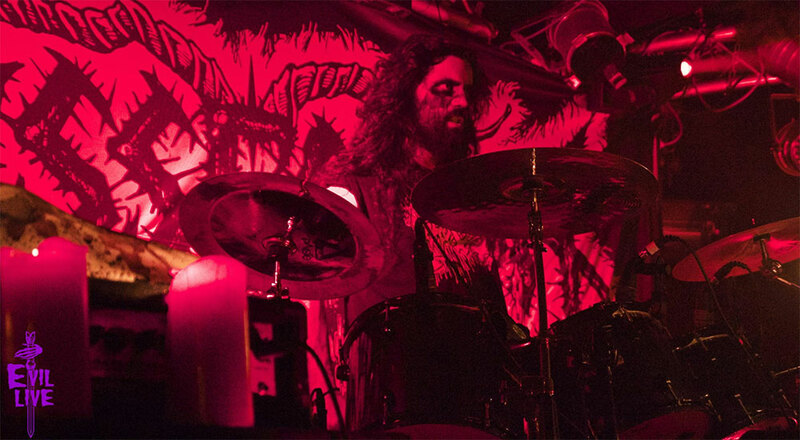 – The fact that we’re a metal band is of prime importance, says drummer Pz.Kpfw, as is everything that comes along with that claim. We’re not playing roles on stage; we’re giving it our all, utterly possessed by the music. We play fast and loud, blood is pumping, tears and sweat running. There are no time-outs, no pauses and no mercy – only POSSESSION whipped into a frenzy. Most of all, we’re bringing danger to the listeners’ faces. 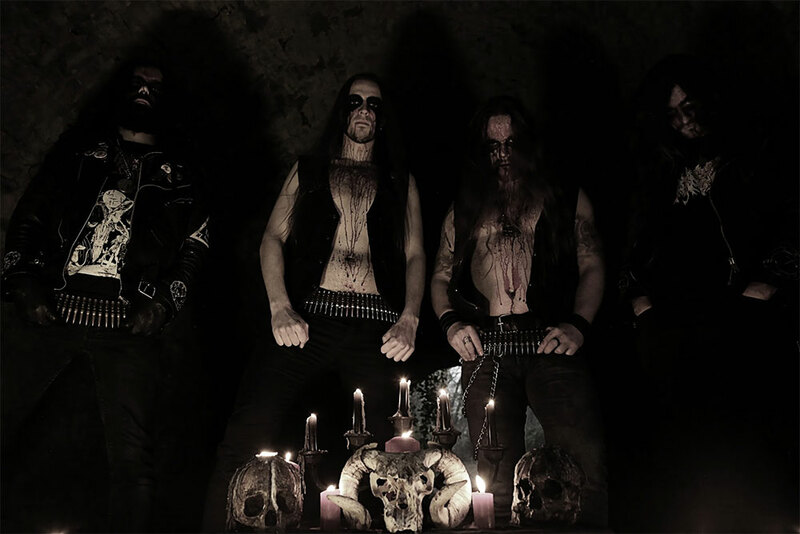 The Belgian black/death metal quartet came into existence in 2012 when four friends, frustrated by a lack in progress with their current projects, joined orchestral forces. – Like many bands, we began by practising in the house cellar of one of our member’s. We struck a deal with the neighbourhood; two hours every Saturday evening. Things went smoothly at first but we soon realised that merely playing five minutes over our allotted time would result in someone calling the police to come shut us down. After being visited by the law more than ten times, they deemed it no longer feasible to continue in that fashion. In what at the time seemed like a stroke of luck, a friend offered them refuge in his small garden house. – This arrangement didn’t last long, his neighbours started complaining and we were forced back to where we started. The two-hour-deal was technically still valid but as soon as we began, the police arrived again. No doubt one of the neighbours saw us loading out our gear and happily assumed those horrible Saturday screams to be a distant memory, only to less than a week later face despair while seeing us drag everything back in again. At that point the band members themselves despaired, seeing as they had studio time booked for the recordings of both their 2013 “His Best Deceit” demo and the following year’s ”Anneliese” EP. – We found a temporary solution; V.Viriakh and I.Dveikus’ previous band, DAWN OF CRUCIFIXION, used to rehearse in the attic of their former drummer. He offered us to finish the writing process there, and it was just in time – we wrote the demo title track on our very last pre-studio rehearsal. With the recordings completed, POSSESSION were once again left searching for a base of operations. Their next stop was in the city of Namur, in the centre of Belgium. – It was a remote warehouse, renovated to accommodate multiple bands rehearsing. We finally started to relax, believing our problems behind us, when the owner of the place informed us that he had to close due to suffering from cancer. Meanwhile; Viriakh had moved house, so they set up shop in his attic and resumed working on new material. – That didn’t last long either, we soon began finding smashed glass bottles around the house entrance – angry neighbours wishing us a warm welcome. As it was now Viriakh’s home, we decided to not pursue further confrontation and once again began looking. Black ‘n’ roll countrymen SPERMAFROST then gave them temporary sanctuary in their abode, an old barn in the countryside. This is where POSSESSION finalised the writing process of 2015 MLP “1585 – 1646”. – We kept receiving signs that we were cursed, destined to split sooner or later. Then finally, as the SPERMAFROST solution was coming to an end – MALEFICENCE from Brussels invited us to their practice room since the band they shared it with were moving out. Needless to say they jumped on the offer, and still occupy the space to this day. – Our relations with MALEFICENCE grew better with time, as we used to raise hell in white night parties every weekend after rehearsals. They say the Devil is in the details; and their lead guitarist is none other than S.Iblis. 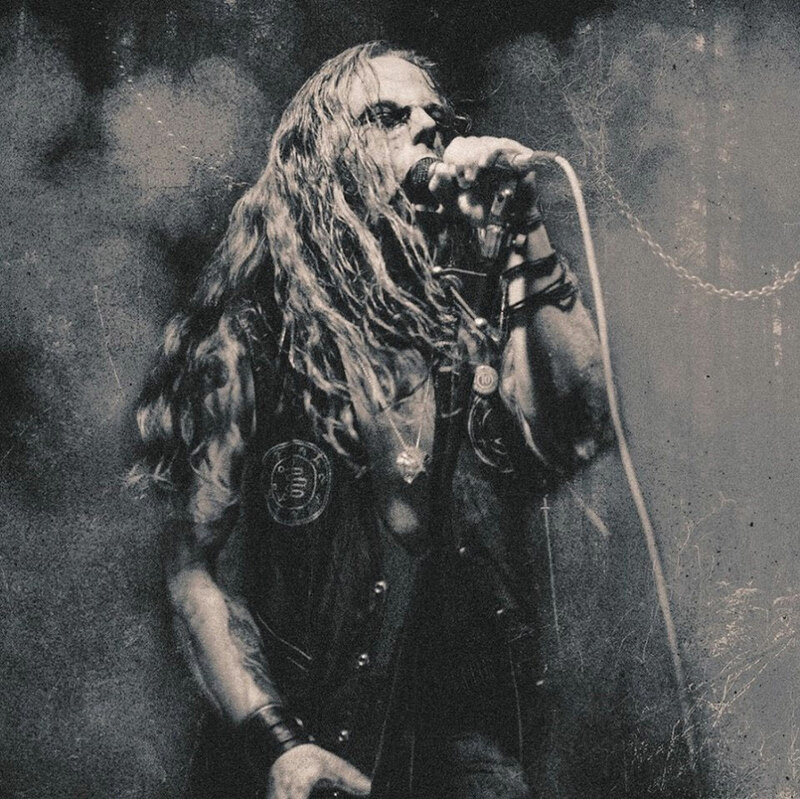 The gentleman in question is also POSSESSION’s new bass player, recruited after Viriakh took over lead vocals following the departure of original frontman Mestema. – For reasons belonging to him alone, says Viriakh, Mestema decided to leave. There was no tension between us that would explain his choice though. He personally asked me to handle the singing, not wanting anyone else to do it – it was his parting wish and we have honoured it. After POSSESSION’s set at the 2015 Chaos Descends festival in Germany, the second-to-last gig with Mestema, S.Iblis approached the band and announced matter-of-factly that they need look no further – that their new bassist stood before them. – He didn’t bother asking for it, says Pz.Kpfw, instead clearly claimed the position as his henceforth. ’I already know all your songs’ he said, ‘I’m ready, let’s get to work now’… and it was no lie; on our very first rehearsal we played the entire set without any stops. He’s fully devoted to the POSSESSION entity, and this attitude commands the greatest respect from us. At first, the remaining three founding members struggled to come to terms with the line-up change. Having lost their original frontman, they first considered re-introducing the band to the underground by putting out another demo. – We wrote “Infestation – Manifestation – Possession”, recorded it during a rehearsal and then sent it to Patrick at Iron Bonehead and Darragh of Invictus Productions. Both our labels agreed that if we were able to deliver such a song in two or three rehearsals with the new line-up, then we were ready to work on a full-length. Possession – Pz.Kpfw (drums), I.Dveikus (guitars), V.Viriakh (vocals), S.Iblis (bass, guitars). Listening to an advance of the new album, “Exorkizein”, I’m curious what the hideous shrieking in the intro is about. One is first treated to the sound of footsteps on stone followed by a creaking door opening to a ghastly racket, with Ludwig van Beethoven’s ”Moonlight Sonata” blaring through a church organ in the background. – The screams are from an exorcism performed in Greece, its purpose is to create a strong and relevant mood. We try to tell sincere stories, and this calls for the type of atmospheric passages all our releases contain. Here, our listeners find themselves in a Vatican crypt where a possessed woman is being exorcised in great pain. Moonlight illuminates the night, so the accompanying organs are obviously related to her. The lunar is of prime importance to the band’s concept and as such crowned its first gig, which in turn coincided with the “His Best Deceit” demo release. – It was the official birth of POSSESSION, says Viriakh, it had to be blessed under a full moon as by her light all occult activities turn more successful. The moon and her affiliated demon are linked to both sigils featured on each of our releases. The track “In Vain” contains another somewhat startling intro – it starts off with an upbeat, catchy keyboard melody followed by someone speaking in French. – It’s the introduction of an old documentary in which you can witness the only existing footage of a Vatican-authenticated exorcism. The narrator is speaking about a priest who is interviewed in the program. ”Exorkizein” is a concept album dedicated to the life and work of The Reverend Gabriele Amorth, last known Chief Exorcist of Rome. He died in September 2016, at 91 years of age. – Father Amorth was surely a brave and devoted man, says Pz.Kpfw, as much as it was foolish of him to believe he could make a difference with his work. At the time of his death we were late in the creative process, so when the news reached us we took it as a sign that we were on the right track. We changed the lyrics and title for the last song in accordance to the updated situation. The composition ended up aptly, if somewhat bluntly, named “Preacher’s Death”. – I think he stared into the eyes of the demon more often than he communed with God, says Viriakh. Still though, he devoted his life to the Lord – and such blind faith and zealous devotion is somehow also fascinating. – What would you say if there was a priest in your village or town telling you stories about exorcism and how the Devil tries to possess us all, and so on? The only available interpretation of the phenomena he faced was through the Catholic faith, the cornerstone of his existence. As much as he might not have been taken seriously, the man still ended his life as the Vatican’s Chief Exorcist. Pz.Kpfw adds that outside of Father Amorth’s servitude to Catholicism, his persona and private habits are entirely uninteresting. It’s the mythical archetype of the exorcist that’s compelling. POSSESSION are far more interested in the powers he supposedly confronted, and by the fight he led for the Vatican. – Real stories preserved in myths have travelled to us through centuries, for the only purpose of inspiring human generations to come – Prometheus, Oedipus… to us, the story of Gabriele Amorth has the same purpose; it shows that evil can’t be defeated, which is a recurring notion on all our releases so far. As the band’s name implies, diabolical visitations have been an obsession of theirs since conception. Their 2014 EP “Anneliese” refers to events fictionally portrayed in Hollywood motion picture The Exorcism of Emily Rose. In 1975, the Catholic Church diagnosed twenty-two year-old German college student Anneliese Michel with demonic possession and authorised an exorcism. Michel came from a deeply religious upbringing, suffered from epilepsy and had a history of mental disorders. Whilst a priest tried to expel the infernal within, an unsavoury cast of alleged evil spirits would speak through her and even quarrel amongst themselves. On July 1, 1976, after many months of this carrying on – Anneliese died from malnourishment. Parents and priests both were subsequently charged and convicted for negligent homicide. I’m curious if my interviewees believe that she really was under the spell of autonomous spirits. Pz.Kpfw says he believes Michel to have attained a higher state of understanding, vision and truth – that she was frightened by this and sought help and understanding from the wrong sources in the church. – What happened next is history… nevertheless, all of us are interested in occult stories and especially ones from our area of Belgium. Mother Europe is the cradle of so many stories of burned witches, haunted places and other obscure local legends. They’re part of us, it’s our history. 2015 EP, “1585-1646” dealt with one such tale – an alleged French witch named Adrienne d’Heur. There seems to be very little information about this lady available in English, though it appears established that she was a widower who was tried and executed for witchcraft. – There are indeed few official documents concerning Adrienne d’Heur, says Viriakh, but what truly interested us were the myths and legends about her. This is what we based the MLP on – her dealings with the devil, the rites she was accused of performing, the torture she suffered from the Holy Inquisition and finally – burning at the stake. ’A.M.S.G.’ states the footer of the band’s contact email, presumably signifying the Latin phrase Ad Majorem Sathanae Gloriam – ’for the greatest glory of Satan’. By this slogan I’d have to conclude there to be some manner of adulation for the sentient force identified as the Devil. – I can’t speak for the other members, says Pz.Kpfw, but I believe there are ways, visions and principles we have all silently agreed to follow through this band. Regarded separately we may have different views on society, and on life’s aims for both the worldly and of spirit. There is however a mutual understanding of what POSSESSION is, and more importantly what it’s not. – I’m convinced that this unspoken pact is what makes this entity so strong – a congruence of individual views merging as our individual personalities slip away, joining as one to awaken the beast. Capital – so, getting back to the devil-worshipping? – I grew up in a family where the principal motto was and still is the following: Watch in silence and learn, as knowledge is the only real virtue of this world. It seems as if one’s outlook is never completed – existence, choices and experiences constantly modify it, therefore I’m not very used to voicing my views and opinions. If something is glorified for all the world to see, then surely it could also be explained. Disregarding theological labels then, perhaps a description of this spiritual ethos. – I’ve studied history and philosophy, and through this I’ve made my life a quest for higher understanding. I seek profound ways of self-accomplishment, and a quest for answers far greater than those offered by society-approved ideologies, or worse. Regardless, POSSESSION is no expression of our personal thoughts. The band’s real aim is simply to convey stories which inspire its members, much like the ones we’ve been discussing. Pz.Kpfw adds that POSSESSION is a ’loyalty-above-all’ band, regarding people who have been involved since the early days and still are. – First and foremost our labels, but also Phorgath (EMPTINESS, ENTHRONED) from Blackout Studio in Brussels who never stopped believing in us. Also, L and M from A Thousand Lost Civilizations, as well as Chris Moyen from ThornCross Artworks. We hail them eternally, we are now stronger than ever before and this is partly because of them. – We had moments of doubts, Viriakh continues, so we had to retreat and adjust. In POSSESSION we’re all in the front-lines, doing our part and are fully integrated to the entity we gave life to – that’s our way of working.